Tesco has submitted a planning application that will provide the permission needed to make changes to the parking restrictions at its Rotherham town centre store - if approved by the local council. Earlier this month, Rothbiz reported first that the largest retailer in the UK intends to introduce restrictions at its £40m Rotherham Extra store at Drummond Street. The latest application seeks a variation over a planning condition inserted by Rotherham Council when the planning application for the 110,000 sq ft superstore was approved in 2012. The national retailer needs the approval if it is to introduce a system that would allow shoppers to continue to park for up to three hours, as is the case now, but only if they spend over £5 in store and validate their parking. The initial condition read: "Prior to the development being brought into use, a Car Parking Management Strategy shall be submitted to and approved by the Local Planning Authority and the approved plan shall be implemented throughout the life of the store. The plan shall include details of the availability of 2 hours free parking for customers and non customers of the store. Reason: To limit the availability of free parking and to encourage the use of sustainable transport." Planning consultants, Montagu Evans is acting on behalf of Tesco. 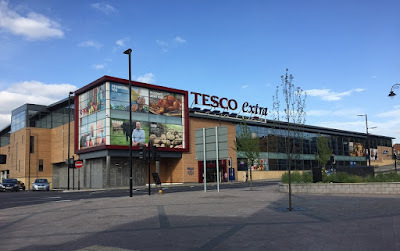 Its plans state: "Tesco have operated the store under the provisions of this management to date, but are now finding that their car park is coming under considerable pressure and is being used by non-Tesco customers, detracting from the attractiveness of the store as a main food shopping location, and in turn impacting on its trading performance." Automatic number plate recognition cameras and signs are set to be installed. "Overstayers" or those that don't validate their parking face a fine of £70. The application adds: "The revised controls will ensure that there are a greater turnover of parking to create more freely available spaces for shoppers to visit both the store and shops located in the town centre. For example, a customer may undertake a half hour shop at the Tesco store where they spend more than £5, and remain in the car park for a further two and a half hours. "We therefore consider that the revised parking controls are sufficient to allow linked trips with other town centre uses, especially on the basis that its main purpose is to serve the Tesco store." Built on land purchased from Rotherham Council, the £40m store opened in 2014 and includes 66,000 sq ft of retail space with planning permission granted for an increase of 36,000 sq ft of floorspace over the old store on Forge Island. If RMBC grants this then it will kill Rotherham Town Centre off even more. Fat cats at Tesco should also hang their heads in shame the penny pinching *******. They already have automated number plate recognition in place for if you exceed the now 3hrs parking limit. I hope RMBC gives them the big middle finger. This is a disgusting move by TESCO. RMBC need to turn this down FLAT and make sure that the people of Rotherham continue to have the access to parking that was agreed in the original planning application. If RMBC are so concerned,why dont they give free parking on there car parks.Tesco is a business,not a charity,you ha e to pay to park in virtually every other town centre.Its RMBC job to get town developments,so that there actually things in town worth paying parking for!